Combine your passion for linguistics with your love of literature. 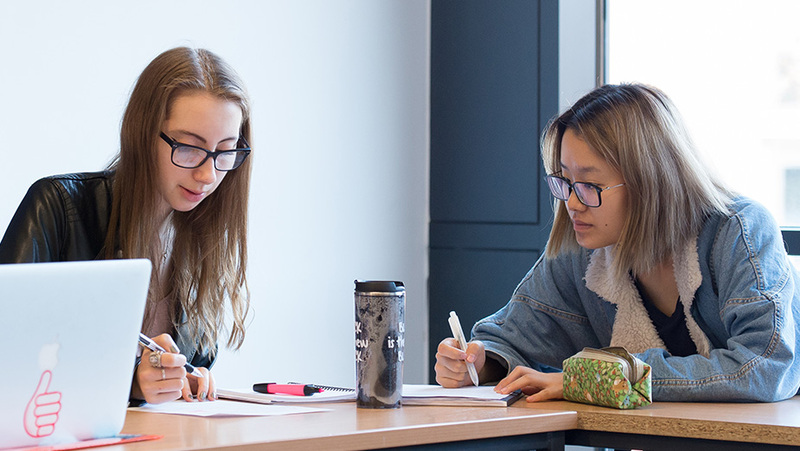 Our English Language and Literature BA enables you to explore the relationship between linguistic structure and its literary heritage – and how language operates in both society and literature. We offer a bold, forward-thinking curriculum that allows you to study a thousand years of literature in new and progressive ways. That's what makes us one of the UK's most respected and exciting departments for the study of English, offering a distinctive approach to a radical breadth of literary texts. We encourage you to experiment with writing and understand its ability to transform the world we live in. You will be taught by engaged and passionate tutors who will guide you through each year of your degree. You'll be part of a close-knit community of staff and students who all support each other. You'll work across a range of disciplines, tailoring your degree to your interests. A-levels must include English Literature or the combined A-level in English Language and Literature, normally at grade A. You should have a broad range of GCSEs 9-4 (A*-C), including good grades in relevant subjects. Pass with 45 level 3 credits at Merit or above of which 24 credits must be at Distinction. Access to HE Diploma must contain substantial Level 3 credits in Literature (you must have at least 15 level 3 credits in Literature). Alternatively, applicants will need A-levels in English Literature or the combined A-level in English Language and Literature, normally at grade A in addition to the Access Diploma. You must either have A-level English Literature or the combined A-level in English Language and Literature or English as one of the Cambridge Pre-U Principal Subjects. You should also have a range of GCSEs at grade 9 to 4 (A* to C), including good grades in relevant subjects. 32-34 points overall from the full IB Diploma. Higher Level subjects must include English, with a final grade of 6. Grade A in A-level, plus DM in Pearson BTEC Level 3 National Diploma. Grades AB in A-levels plus Distinction in BTEC Level 3 National Extended Certificate. In addition to the BTEC Level 3 National Extended Diploma, you will also need A-level English Literature or the combined A-level in English Language and Literature normally at grade A.
Highers must include English at grade A. You would normally be expected to have an Advanced Higher in English (at grade A). A-levels in either English Literature or the combined A-level in English Language and Literature, normally at grade A. Successful applicants will need to achieve a final mark of at least 8/10 in English. Relevant state (Year 12) High School Certificate, and between 92% to 88% in the ATAR or UAI/TER/ENTER, or a Queensland OP of 3 to 4 or better. You will need to demonstrate high levels of ability in literature. Reifeprüfung or Matura with an overall result of between 1.8 to 2.0 or better for first-year entry. Ontario Secondary School Diploma (OSSD) 75% from 6 grade 12 U, U/C or M courses. British Columbia Certificate of Graduation AAABB-AABBB from 5 grade 12 courses. Apolytirion of Lykeion with an overall average of between 19 /20 and 18.5 /20 will be considered for first-year entry. Højere Forberedelseseksamen (HF) or Studentereksamen with an overall average of at least 7 on the new grading scale. Pass Ylioppilastutkinto with overall final result of at least EEEM, including English with grade M.
French Baccalauréat with overall final result of at least 13/20 to 14/20. In the French Baccalauréat you will need at least 14/20 in English. German Abitur with an overall result of 1.8 to 2.0 or better. You will need a final result in your German Abitur of at least 14/15 in English. Apolytirion with an overall average of at least 18.5 will be considered for first-year entry. Erettsegi/Matura with a good average of at least 55544. Irish Leaving Certificate (Higher Level) at H1,H1,H2,H2,H3 to H1,H2,H2,H3,H3. Irish Leaving Certificate Higher Level subjects must include English at grade H1. Italian Diploma Di Maturità or Diploma Pass Di Esame Di Stato with a final Diploma mark of between 81/100 and 85/100. Sijil Tinggi Persekolahan Malaysia (STPM) with grades of AAB-ABB, Matriculation with a least a grade of 3.5 or UEC with an overall average grade B3 (75%). Pass Matura with least 3 Extended level subjects including Literature in the 75th percentile. Diploma de Ensino Secundario normally with an overall mark of between 17/20 and 18/20. Diploma de Bacalaureat with an overall average of 8.5 including a score of 8 in a Literature subject. You will need at least 8/10 in English. Fullstandigt Slutbetyg/Högskoleförberedande Examen with a total of 2,500 credits to include B grades in the majority of subjects and to include grade A in Literature studies. Advanced Placement Tests with scores of between 5,5,4 to 5,4,4 in three subjects. If you've taken the ACT we'd expect to see a composite score of at least 26. A placement is a great way to network and gain practical skills. When you leave Sussex, you’ll benefit from having the experience employers are looking for. Find out more about placements and internships. The School covers the cost of tickets and workshops at the Globe for the Spectacular Imaginings module, but students must pay for travel. There are occasional trips to museums, galleries and cultural partners. Travel is not normally reimbursed but can be subsidised depending on the project. Students who lead creative writing workshops in secondary schools will have their travel and other costs covered. digital marketing executive, Media Plan. By studying English Language and Literature, you gain skills in critical assessment, written communication, independent thought and problem solving. speech and language therapy, education and language teaching. Embrace kindness, care for each other and celebrate the diversity of our campus community. At Sussex, you can join our Students' Union peer-to-peer support network, the Buddy Scheme, where you'll make new friends and get help to settle into university life. Meet Olivia and Jessica, who met through the scheme a year ago. "When I came to Sussex I was quite shy and didn’t really meet many people. So, in my second year I decided to volunteer for the Buddy Scheme. "I thought that maybe I could help new students settle in. I was paired with three girls from my department and we went out for breakfast during Freshers Week and had a great time. "We went on the pier and had some photo booth pictures taken and really got on well. "It started with me wanting to help people, but I found people who can help me too – like Olivia, she’s been really supportive. I feel the Scheme has given me the opportunity to be the best version of myself. It’s made me feel that I can do anything." "It’s been a year since we met and we’ve been really good friends since. I joined the Scheme because I was a bit older when I came to Sussex and was worried that I wouldn’t fit in. But it was exactly what I needed. "Jess is really lovely and makes us all feel really comfortable. We have so much in common. It’s made me feel more relaxed, having somebody to talk to, not just as a friend but as a colleague too. "I recommend anyone to join the Buddy Scheme. It’s really caring at Sussex, which makes it a great environment to be in." Find out more about the Buddy Scheme.